Contrary to a story often told, if there's a single location in geography which can be said to be the originating center of Western culture it wouldn't be the Parthenon so much as the southern slope of the hill below it. Aeschylus, Sophocles, Euripides, Aristophanes, Menander; the festivals of Dionysus; Lycurgus; the classical Ekklesia. Tragedy, democracy. Here, in this place. Exactly. On Friday, December 14, 1979 I stood here in chilly winter sunshine performing Agamemnon as reader's theater with several of my schoolmates, watched by a small crowd of English and German students and an even smaller number of tourists. On this trip my friend and I are more modest, content to explore, sit in the audience, and imagine as best we can. 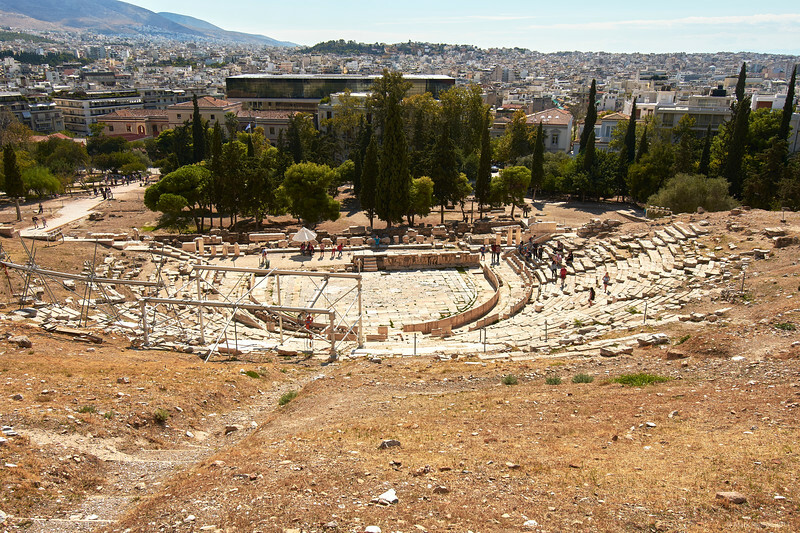 99% of what you've ever seen in a theater or on a movie screen or on your TV traces to the performances in this place in the fifth century BC. It's worth the visit.